L: I worked in sales at a software company. I was traveling a lot and felt like I was stuck staring at a computer most of my day. 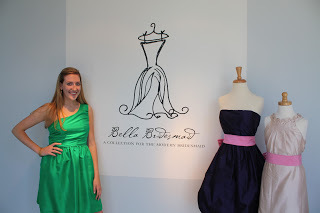 I was a bridesmaid in a friend’s wedding and fell in love with the Bella Bridesmaid franchise. 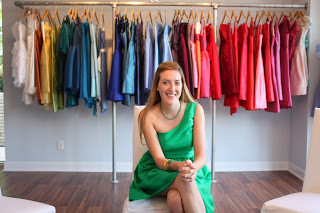 I was very attracted to the idea of helping brides and their maids select beautiful gowns. It has been a very rewarding job. L: One of my best friends got married last fall. It was so wonderful to help her select dresses and then be part of the wedding day as well. It was very touching to be asked to be a bridesmaid and wear the dresses from Bella Bridesmaid. L: I have Lula Kate’s Zoe dress with a straight skirt in Black and it definitely serves as my LBD. I put a cardigan and belt over it with wedges for dinner and drinks. Or, I can dress it up with heels and big pearls for the perfect cocktail outfit. L: I loved Kate Middleton’s dress. I think every little girl watched her wedding and dreamt of being a princess in that gown. But a close runner up would be Grace Kelly’s dress which I think was probably a source of her inspiration. L: I love anything with inspired by the 1960’s fashion. I get a lot of great ideas from watching Mad Men. All my outfits aren’t complete without a chunky necklace and colorful handbag. L: I studied abroad in Chile during college. 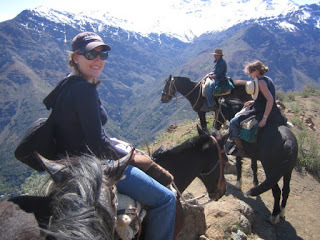 One weekend we climbed parts of the Andes Mountains on horseback. The views were incredible. Still baffles me how they were able to create such large stone statues and transport them across the island. L: The Breakfast Club- I grew up watching that movie and I could watch it a thousand more times. BB: Everyday wear item? ie: pair of earrings, fave cardigan, scarf. L: I never leave home without pearl earrings. During summer, I always have my big pair of Jackie O sunglasses. L: Prince Harry for sure. He’s better than a celebrity. He is royalty with an accent! Sun or Snow? Sun. Its almost summer and I can’t wait. Dine out or Home cooked meal? I love dinning out with friends. There are so many fabulous new restaurants in DC, I want to try them all. Rock n Roll or Country—I grew up in Kentucky so I certainly have some Country on my iPod.